Congratulations! At 37 weeks, your baby is officially full term. You may still have a few weeks of pregnancy to go, but you no longer have to worry about giving birth prematurely. Enjoy these last few weeks before your little one arrives. At 37 weeks, your baby is about 19 inches long from head to toe, and he weighs around 6.3 pounds. The Mayo Clinic reports that your little one is now considered full term. Although, it is still in his best interest to remain in your womb for the full 40 weeks, your baby's organs are fully functional. Right now, your little one is continuing to gain fat stores and get longer. As you approach your due date, you may notice that your vaginal discharge seems heavier. It may also contain more cervical mucus. If you notice a significant quantity of mucus, possibly accompanied by a small amount of blood, you may be passing the mucus plug, according to the American Pregnancy Association. For the last several months, this mucus plug has sealed the opening to your cervix. As your cervix begins to dilate, the plug is released. Also called "bloody show," this can be an early sign of impending labor. Labor can happen hours, days, or even weeks after you pass the mucus plug. Be sure to keep an eye out for other signs of labor, such as contractions, bowel changes, and leaking amniotic fluid. Loss of the mucus plug isn't cause for concern at 37 weeks, but you should mention it to your healthcare provider. If you notice a lot of blood or if you have more than a couple of tablespoons of mucus, call your doctor or midwife right away. 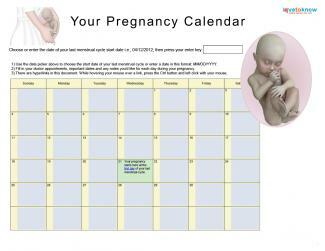 During pregnancy calendar week 37, many women notice the start of the "nesting instinct." If you suddenly find yourself cleaning out the fridge in the middle of the night or vacuuming out the light fixtures, this may be what's going on. Although this behavior may be as subtle as making a trip to the store to stock up on newborn diapers, it may be as dramatic as a sudden uncontrollable urge to clean your entire home from top to bottom. While nesting behavior is completely normal at any point in your pregnancy, the urge to clean and organize can be especially strong right before labor begins. While it may be almost impossible to fight your nesting instinct, the Mayo Clinic stresses that it's important to make time for adequate rest during the final weeks of your pregnancy. Avoid heavy lifting or rigorous activity, and make sure you get plenty of rest. This may mean that you need to put items like napping on your to-do list. Although symptoms like nesting and losing the mucus plug can be signs of impending labor, your delivery date may still be weeks away. Take time to take care of yourself, and keep eating a healthy diet. You'll need all your strength for the big day.